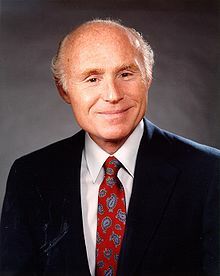 Herbert H. "Herb" Kohl (born February 7, 1935) is an American businessman and politician. He is a former United States Senator from Wisconsin serving from January 3, 1989 through January 3, 2013. He is a member of the Democratic Party. Kohl is also a philanthropist and the former owner of the Milwaukee Bucks of the National Basketball Association. He did not seek reelection in 2012 and his term ended on January 3, 2013. He was succeeded by fellow Democrat Tammy Baldwin. ↑ "10 Things You Didn't Know About Herb Kohl". US News. Retrieved 2014-08-08.